AE Tools & Computers and Automotive Test Solutions are pleased to announce a new ELECTRONICS ‘101’ Training Class! The modern vehicle is loaded with advanced electronic control systems. In order to repair these modern marvels you will need an in-depth understanding of electronics to the circuit level. This hands on class will cover the operation and testing of basic to advanced electronic circuits. This class provides each participant with an advanced electronic engine simulator so bring your scope, amp clamp, and meter. If needed we can supply an ATS eSCOPE ELITE4, please let us know when making your class reservations! This class will give you 2 full days (16 hours) of hands on training for only $600! The price includes coffee and snacks, lunch both days, and a printed manual packed with information! Flights, hotel, transportation and dinner are not included. 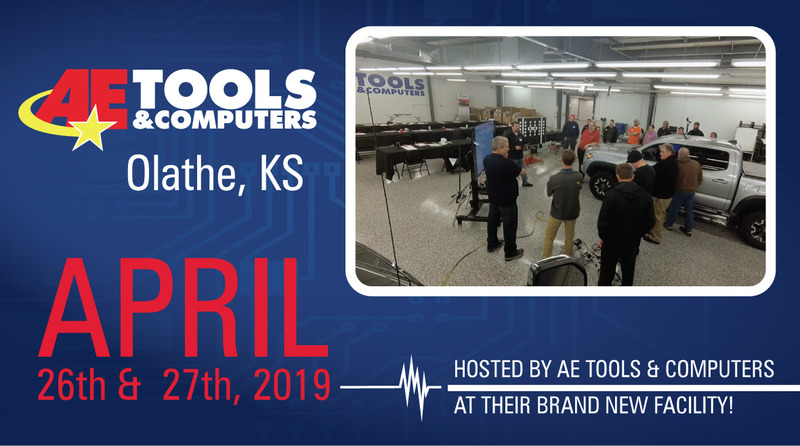 The class will be hosted by AE Tools & Computers at their BRAND NEW facility in Olathe, KS! VISIT OUR SITE AND PURCHASE THE CLASS ONLINE! YOU WILL NEED TO REGISTER AN ACCOUNT, LOGIN, SELECT THE TRAINING TAB. LOCATE THE CLASS, ADD TO THE CART, AND COMPLETE THE PAYMENT. YOU CAN CANCEL YOUR RESERVATION AND RECEIVE A FULL REFUND UP TO THE 15TH OF APRIL. AFTER THE 15TH OF APRIL, CANCELLATIONS WILL RECEIVE A 50% CREDIT TOWARD A FUTURE TRAINING CLASS. Bernie Thompson is the owner of Automotive Test Solutions (ATS) with business partner Neal Pederson. Automotive Test Solutions was established in 2000 and has become a world leader in innovative automotive test equipment. Bernie holds over 25 patents on vehicle tools and design. During the research and development of ATS automotive equipment Bernie has developed a deep understanding of vehicle systems. Realizing the need for better education in his field, Bernie has also developed an advanced training curriculum for the automotive industry. In addition to publishing articles in Motor Magazine, Motor Age, and Professional Tool and Equipment, Bernie has presented workshops at automotive conferences including NACAT, ASA, Vision, Automechanika, TST, WTI, CATS, AVI, and CARS. Together, Bernie and Neal have released patented and proven technologies that have been recognized by Motor Magazine’s prestigious “Top 20 Tool Awards”, Professional Tool and Equipment “Tool Innovation Award”, Undercar Digest “Top 10 Tool Award”, TST’s “Top 10 Tool Award”, Transmission Digest “Top 10 Tool Award,” and Tech Shop’s “Top 5 Tool Award”. Bernie is looking forward to sharing his dynamic ideas on automotive electronics, ideas you can use daily in your service bay.